Today was my opportunity to finish the Berlin Wall route that I started on Saturday. As I discovered when doing Part 1, it is NOT the route of the Berliner Mauerweg (the official Berlin Wall cycle path). Because it’s such a long distance (over 100 miles/160km) and it’s hard to do it at a good speed due to the terrain and also the fact that there are lots of things to stop and look at, I split the route into two. I learned some things from Part 1, the main lesson being that it’s advisable to do this route clockwise as the signage seems arranged for that. The second thing I learned is that it takes ages as the paths can be very basic and it’s easy to get lost. Fortunately this time I had 24 fewer miles to do and as I set off at 9:30am I had plenty of time in hand. Before I left I pumped up my front right hand tyre which seemed a bit soft. The track pump was in the car (which was outside the apartment where Ken & Kenny were staying, over a mile away) and as it was in the wrong direction I couldn’t be bothered to go to the car so used my mini hand pump instead which has a rather vague pressure gauge. It looked as though the tyre was up to about 65psi which seemed like enough to be going along with. I set off on the same road I took on Saturday to get to my start point, outside Spandau on the border of Gatow. On the way I saw this sign – the Germans are proud of their cycle routes! I was just half a mile from the point where I join the Mauerweg (Wall route) when my steering started going a bit spongy. Oh no, puncture. In the front right hand wheel, the one I had pumped up earlier. So I flipped Alfie on his side, whipped off the tyre and tube, found the hole in the tube, picked a few bits of glass out of the tyre, put a fresh tube in, repaired the old tube, pumped up the tyre and I was ready to roll. Lots of people passed me whilst I was doing this but no-one asked if I was OK. In the UK a passing cyclist would almost always check you had everything you needed. Still, this had only delayed me for 15 minutes and it wasn’t too much of a hassle (it wasn’t raining, for example) and I had seen a red squirrel running around a tree right by me so I was still cheerful as I set off again. I joined the Mauerweg and almost instantly it left the roads and started off down a track. Oh no, I thought, not more off-roading, but this track wasn’t too bad. It took me through a park called Fort Hahneberg which seemed very large and had lots of people wandering around or sitting on benches, even on a Tuesday morning. The signage seemed to be working OK for me (you can see the Mauerweg sign on the left here) and was following the former route of the wall fairly closely. This information board explains how the former death strip has become a green wildlife haven. A photo of me and Alfie taken on the self-timer. You can sort of make out where the No-Man’s-Land was in this photo – a slight ditch marks it out. This is an example of the Wall Information Boards that you can find along the route. They mostly seem to be on the western/northern sections of the route and there seems to be one at each point where someone was killed (except in the centre of the city) as well as at many other points of interest. This one is explaining about a church which was slap-bang in the middle of the border and ended up being pulled down and rebuilt elsewhere. After reunification the new church was given this piece of land, where the old church had been, for sport and social events. I started to get to very familiar territory now with names on road signs which I remembered from my time in Berlin in 2007. We stayed then for five weeks in Falkensee which is outside the city limits of Berlin (west of Spandau) and I used to get the train into central Berlin for my language course. The train went through Spandau, Staaken, Falkenhöh on its way to Falkensee and I was tempted to detour to visit where we stayed. However I soon remembered that the roads around there were all cobbles, plus it was several kilometres away so I decided against. Here is a cycle route sign and you can see the Mauerweg little signs as well under Schönwalde and Falkensee. As I mentioned on the Mauer Part 1 blog, there were yellow arrows painted on the road to help you know which way to go for the Mauerweg. These were no use to me last time as I was going anticlockwise but this time they were very helpful – in fact following the signs was fairly easy. In the whole day there were probably only 3-4 occasions where I would have got lost were it not for also having the GPS which showed me the rough direction I ought to be heading. As I was pootling along through yet another bit of parkland I came across this information/memorial. I didn’t realise at the time but this was a fascinating display and I spent probably nearly an hour here overall, reading everything and getting quite emotional at times. It had stories of people who lived in Falkensee and what it was like when the wall came up and they were cut off from West Berlin (80% of men in Falkensee worked in West Berlin so of course could no longer go to their jobs). There was loads of information on the wall going up, people trying to escape, but what was most moving was the stories about when the wall came down. People from Spandau and Falkensee, who had been separated for 28 years despite being almost next-door neighbours, welcomed each other brilliantly. The Spandau people gave money to the Falkensee people, there were fairs and special events to celebrate coming together again. There were quotes from lots of people dated 2011 (so it’s a very new installation) about life then and now. The description explains this is British Soldiers from the Royal Engineers whose job it was to tear down the wall. First of all they signed all their names. Seen from the other side the panels make out the shape of the wall between Falkensee and Spandau. And here we see the border – out of Berlin and into Falkensee (which is in Havelland) – which you can just drive/cycle through. I carried on, enjoying stopping to look at various information boards as I went. The overall route was much better this time with no appalling off-road stuff and generally reasonably asphalted surfaces. I wonder if they’ve been spending money on the Mauerweg in the Spandau/Falkensee region recently. There were some bumpy and mucky bits of path, of course, and after one I noticed something weird on my left mudguard – photo hasn’t focused on the right thing but there’s a worm suspended from the mudguard mount! I rescued him and put him on some soil. “Continuing west on the trail will bring you to the Havel River and to the weekend communities Fichtewiese and Erlengrund. They, too, were West Berlin exclaves on the territory of the GDR. Owners needed to cross through the border installations to reach their property, using an intercom at the gate near the recreational area Bürgerablage to announce their arrival to the GDR border guards. It was not until 1 July 1988 that an exchange of territory with the GDR restored free access to these weekend properties.” I liked a photo that I saw of a woman ringing a doorbell in the wall! Look at this fab path! I was beginning to feel a bit peckish and hoping to stop for lunch somewhere. I found myself at a lake (the Nieder Neundorfer See) which looked rather inviting but there didn’t seem to be any food options. And I soon stumbled across this former watch tower which is now a mini museum. Unfortunately in getting off my trike to go inside the museum the camera slipped in my hand and there is now a big crack across the viewing screen on the back. Fortunately it still appeared to work OK! I went inside the watchtower. The staircase was a bit tricky! (Sorry about the fuzzy photo). Another sign at another border crossing – note the different date/time that this crossing was finally permanently opened. I carried on along a varied scenic route from Hennigsdorf to Hohen Neuendorf which brought me to the last border crossing to go into operation – shortly before the fall of the Berlin Wall – near Stolpe. The Berliner Mauer website explains: “In order to reduce the traffic load on the F5 (or B5) highway, which was no longer able to accommodate the rising traffic between Hamburg and West Berlin, the GDR built an expressway (today’s A111) from 1981 to 1982 that was paid for by West Germany. The Stolpe border crossing opened in 1982, but originally served only travellers driving from West Berlin to Scandinavia. It was also possible to enter the GDR (even for pedestrians using a shuttle bus service to the border) at Stolpe. Traffic to Hamburg, however, continued to be routed through the old Staaken border crossing on Spandau’s Heerstrasse. Construction of the West Berlin feeder road through Tegel Forest was delayed: citizens’ groups were worried about damage to the environment and had filed suit against the clearing of woodland.” The crossing was nothing now – just a bridge over the motorway with a rather mournful feeling about the place. From here I cycled along the edge of Tegel Forest and the golf course Stolper Heide and through the “Invalidensiedlung,” a settlement built for disabled veterans of World War I, to Hohen Neuendorf in Brandenburg. I was feeling rather peckish at this time (2:30, I had been on the bike since 9:30 with no food/drink stops) so stopped at an Italian restaurant for my only proper meal not in the apartment. Free starter of olives and bread. Healthy chicken salad – well, it was healthy before the super-generous portion of olive oil served on it. Oh dear, the radweg is now cobbles. And it continued to be cobbles for about two miles. What was doubly annoying was that my GPS showed the actual Wall had continued down the main road in the photo above, whereas our route wended its way through woodland for two miles, adding a mile and a half in total to the journey. However, clearly the Wall did run somewhere near as I saw this interesting building, a former watchtower which is now a youth’s wildlife building. Shortly afterwards I passed this memorial to the victims of the Wall. And then, whilst cycling through Reinickendorf (I think!) I saw this house being built. The entire gable end is one piece, suspended on a giant crane. Another piece of wall sculpture – an enormous metal bird! After some faffing around (I was now in the busier bit of Berlin which meant traffic lights to cross roads, etc) I ended up a Mauerpark. This is a park which is in the former area that the Wall stood. However it seems rather run down and had some slightly dodgy-looking characters in. There’s some kind of large stadium (new) and in front of it some old steps which seemed to be looking at a basketball court. I took a quick pic. And now I found myself in Bernauer Straße, somewhere I had visited four years ago but couldn’t remember where it was! A photo at ground level. I then climbed the observation tower to take a look. And a view of the skyline (sorry the exposure isn’t great) with the Fernsehturm visible, as is the golden roof of the synagogue towards the right hand side. Another old watchtower which contains the Günter Litfin memorial. Almost back, the Reichstag peeping out over some new buildings. Oh look, I’m back here again! The Brandenburger Tor, which means I have now completed the whole Wall route. In celebration I bought myself a nut pastry thing to have when I got back at 6pm with a cup of tea! I feel pleased that I completed the route, and also pleased that today’s route was much nicer, easier to follow and with better surfaces. I wasn’t particularly looking forward to a repeat of Saturday’s journey. My feeling about the Wall and Berlin is that most Berliners want to forget it. There is some information here and there but mostly it’s being forgotten about (as much as it can – I think it lives on in the East Berliners’ minds quite a lot). The double row of cobbles marking the Wall route seems to not be replaced if the road is resurfaced and wasn’t visible for most of the route anyway. My recommendation to anyone else doing this is to spread it over three days so you’ve got more time to spend looking at memorials and museums, etc. Oh, and learn German first, as although some things are also in English, an awful lot is just in German. Overall it was a success. I have one more full day here which means I can pick a route for tomorrow. I might cycle around the Tegeler See, but I think rain is forecast so I may do something closer to home. Watch this space! Today was Sunday. As I had travelled to Berlin with a minister in the United Reformed Church, I suggested he might like to come along to a church service. He’d never been to one in Germany before so was interested, but wasn’t daring enough to go on his own. I said I’d keep him company, I’ve been to a dozen or so churches in Germany over time so I know what to expect. On the way to the church (which was right by where Ken was staying, about a mile and a quarter from my flat) I saw this beer trailer. Beer to Berlin is a bit like taking coals to Newcastle, surely! I also passed a Trödelmarkt on the way to the church – this is a flea market with lots of old records, cutlery, rugs and endless other things I wasn’t interested in. This is a blog about cycling rather than church, suffice it to say that Ken found the whole experience a bit weird. Because the Germans seem to sit down to sing and stand up to pray (t’other way round in most English churches) we kept being caught out standing up or sitting down at the wrong times. The congregation continually burst out into little bits of song that weren’t written down anywhere so we didn’t have a clue. Likewise the Lord’s Prayer and Nicene Creed weren’t written down for visitors – we know them in English but not in German. I think Ken has gone away with much food for thought about how much churches assume people know… and perhaps they don’t. On the way back I treated myself to an apple pancake thingie. After lunch I faffed around for a bit, then decided it might be time for a cycle ride! Having done 73 miles yesterday and as it was very warm today (29 degrees) and time was marching on (it was 3pm by the time I got myself ready to go out) I decided to do a shorter ride than normal and picked a route I had downloaded before I left home, just called Grunewaldrunde. I’ve tried to screenshot the route but for some reason the iPad refuses to rotate it. If I rotate it within WordPress you get a very small version. So here it is, full size on its side and correct-way-up in miniature. As part of this faffing around I appear to have lost (permanently) the header picture of both trikes which was at the top of each blog post. I can restore it when I get home to a ‘real’ computer which has the images saved, but at the moment we’re stuck with a bookshelf. Apologies! So anyway, off I went with trike, still a bit dusty after yesterday’s exertions. This is cyclist’s eye view of the main road through Charlottenburg to the outside world (well, Spanndau). I arrived at the Grunewald after about three and a half miles (please note that the screenshot map above is of the other chap’s route which started at a different place to my route). There was a small amount of zigzagging through quiet roads and then I was on the long – and very long it was too – straight that leads south west beside the Grunewald. This path is actually beside a motorway, although there are trees screening it so the road isn’t particularly disturbing. Also because today there was a huge traffic jam and not much was moving – it was great to be going faster than cars on the motorway! See what a lovely wide, smooth road this is, just for cyclists, walkers and skaters. After about four miles of this I turned right onto what is a proper road (with cars even!) which headed across to the shore of Wannsee. This section was actually a bit more up and down and my trike was skipping gears rather a lot. Now Alfie has done 1000 miles he’s due an oil change in the Alfine hub gear (which I haven’t yet done) and I also expect I need to adjust the indexing a bit, although I haven’t got the faintest how to go about this. Very occasionally he seems to go into ‘neutral’ or a ridiculously low gear but I’ve read that this happens to other people whilst they are running in their Alfine, and if you just change up or down a gear it sorts itself out. I stopped and had a look at the back wheel – some errant pieces of grass were stuck around the cogs and, having pulled this out, he behaved much better. Anyway, with some slow ascents and speedy descents, I found myself on the shores of Wannsee. A bit further along I found a beach with lots of people sunbathing and some others swimming. I dipped my toes in the water. I saw the beer garden, of course, and also saw people looking out of the tower so wondered about climbing up there, but discovering it cost 3 Euro to go up, plus having a heavy bag (lots of tools, water etc) and shoes with cleats, I decided against it. I photographed the tower instead. Very soon I was at the top part of Grunewald again, joining up with the route when I arrived. However, the GPS track had an extra little bit which went into the middle of the wood. I thought I might give that a go, so set off. Anyway, the road started a curve up to the right which got tighter and tighter – and steeper and steeper. Really steep, in fact. I zoomed in on my Garmin and it said my destination was Teufelsberg (Devil’s Mountain). Ah. From Wiki again: “The Teufelsberg (German for Devil’s Mountain) is a hill in Berlin, Germany, in former West Berlin. It rises about 80 meters above the surrounding Brandenburg plain, more precisely the north of Berlin’s Grunewald forest. “It is an artificial hill with a curious history: it was built by the Allies after the Second World War from the rubble of Berlin during the following twenty years as the city was rebuilt. One estimate for the amount of rubble is about 12 million cubic meters, or about 400,000 buildings. It is higher than the highest natural hill (the Kreuzberg) in the Berlin area. “Teufelsberg’s origin does not in itself make Teufelsberg unique, as there are many similar man-made rubble mounds in Germany (see Schuttberg) and other war-torn cities of Europe. The curiousness begins with what is buried underneath the hill: a Nazi military-technical college designed by Albert Speer. The Allies tried using explosives to demolish the school, but it was so sturdy that covering it with debris turned out to be easier. When I finally got to the top, having crawled up in a low gear, passing a bunch of German youth who were doing skateboard tricks (and regularly falling over, although not appearing to mind) I found it wasn’t Wild Boar that were a problem but the mozzies. When I reached the top there was a gate preventing access to the buildings (the old ski station?) and I stopped to get my camera out, whereupon I felt dozens of mozzies on me. I swiped them away madly but I could hear them buzzing round me in a cloud. Little devils! So I got straight back on the trike and whizzed down at high speed, which was great fun (and the skateboarders were cheering me too). When I got home I noticed I had nine mozzie bites on my back, which I assume came when I was standing up on Teufelsberg as the rest of the time my back is against the bike seat. So I made my way back to the main road and headed back to my apartment, picking up some milk at Kaiser’s (a supermarket) which was having a special “We are open on Sunday” day. Almost all German shops are closed on Sunday so this is a new thing. The shop was doing a good trade too. Once I’d had my shower it was time for some more of the Kalte Hund cake. Yum! Just 24 miles today, but it was hot and I left it a bit late to set out so wasn’t too disappointed. The Grunewald is interesting and I am, once again, really impressed with the cycling facilities – and how much they are being used! No heart rate data as I didn’t wear the strap as it was a bit itchy after yesterday’s long ride! This morning was my chance to catch up with a good friend, Ines, who lives in Berlin. She is going on holiday tomorrow but suggested we meet for a cup of tea at a nice tea room she knew about in Schöneberg, so I put the address in my Garmin and set off. After less than a mile I came across this unusual installation. It seemed to be a large metal sheet with names of people who had been killed in various concentration camps, there was also a train carriage with stone shapes in it (sculpture) and a few other sculptures. After a bit of a look at the sculpture I carried on, following my Garmin’s route which was largely on very good roads with cycle paths. I haven’t visited Schöneberg before (that I can remember, anyway) and so it was all new to me – although to be honest it looks like most other bits of Berlin. It had an enormous selection of different teas, including 21 varieties of Rooibos and four pages of ‘black tea’. I had brought my teabags along but Ines said the teas here were very good and I ought to try one, so I was brave and went for “Old English Tea”. The shop also offered “High tea” (cake, cucumber and salmon sandwiches, etc) but that was pretty pricey so instead I went for the scone & jam & clotted cream, that well-known German speciality. I asked the guy serving how he said ‘scone’ – he said he has a friend from London who says scone (rhyming with cone) and a friend from Newcastle who says it rhyming with ‘gone’, so he wasn’t sure which to use. I realised I use both, so I was no help. Anyway, the tea and scone duly arrived. Notice the little liquid eggtimer which is to tell you when your tea has finished brewing! And he had even put proper milk on the tray for me. What a result! Here is a close-up of the scone which was very nice, although the cream wasn’t really clotted cream. Most amazing of all, THE TEA WAS ACTUALLY NICE! Yep, I have finally, after years and years of drinking appalling tea in Germany, had a cup of tea that tasted good. Hurrah! I told the café owner this and he said that the company Ronnefeld was good – however I’ve had their teas in the past and not liked them. But Old English is clearly OK.
And I reciprocated. She found the recumbent trike most comfy! We said goodbye and I headed off in a bit of a random direction, deciding to do a bit more riding rather than going directly home. Eventually I decided to go and visit the Kaiser Wilhelm Gedächtniskirche which is a wonderful church at the head of the Kufürstendamm which was damaged during WW2 and has been partially rebuilt. I started typing the name into my Garmin and it came up with “Kaiser Wilhelm Platz” which I duly navigated to (only half a mile away) before realising that it’s nothing to do with the church. I had been there before for some reason, however, as I remembered this memorial to the concentration camps in Germany. I navigated by road signs back to my apartment to grab a quick sandwich before heading out this afternoon, I think to the Grünewald. Watch this space! Plan for this afternoon was to visit Spandau. The main reason was to go to the Deutsche Bank there (where I have an account) to pay in some money and to try to get them to stop posting me statements (and charging me for them! ), but I also fancied a visit out to the west of Berlin which I haven’t visited much before. I have been to Spandau several times but that was starting at Falkensee (further west) where I stayed for five weeks in 2007. The bit between Spandau and central Berlin, known as Westend, was pretty much a mystery. So I located the Spandau Deutsche Bank on my Garmin and asked it to plot me a route there. I crossed a river just before Spandau (Havel?) and then arrived in the market square which was heaving with stalls selling crepes, beer, Bratwurst, that kind of thing. It was very crowded so I didn’t stop to take any photos. I went into the bank and there was an enormous queue so just paid in my money at the automatic machine and left – couldn’t face the queue, plus I wasn’t sure quite how I was going to explain what I wanted them to do. Banking in German has an awful lot of long words…. So having ridden through the centre of Spandau (it was as I remembered) I headed home on a slightly different road, again crossing the river. I’d only done six miles by this point and it was only 5pm so I thought I could do a bit more exploring. When I saw a sign for Olympiastadion I thought that would be a fun visit! I have in fact been to the Olympiastadion once before, on my first ever visit to Berlin about 11 years ago, when I went with a friend who is very much into sport. It was fascinating to look round this relic of the 1930s and although my German at that point was pretty much monosyllabic, and my companion’s was worse, we managed to chat a bit to a caretaker about it. It was weird to see the buildings made by Hitler for his Nazi Olympics, knowing this was where Jesse Owens won all his medals. Anyway, back to September 2011. Clearly they’ve made a bit more of the stadium now as there wwere signs for a cycle route to it (last time I went by U-Bahn but it was a bit hit and miss finding the place). The route went through some woodland which was nice, but there were a few cobbled sections of road which are pretty uncomfortable on a trike. Anyway, the first thing I got to was the Glockenturm (belltower). This didn’t appear to be open to the public so I carried on a bit further and after nearly a mile found myself in front of the main stadium with its olympic rings. Unfortunately commercialism has come to the Olympiastadion and it cost 7 Euro to get in, so I decided to give it a miss this time. I heard a weird noise behind me and turned to see loads of police on motorcycles going past. In fact they kept going round and round (the road was a long oval) so I wonder if this is where they practise formation motorcycling. I decided to head off back home and set off down the road, being overtaken by the motorcyling police of course (they were much faster than me). About half a mile from the stadium I crossed a bridge and a star of David on it caught my eye. Eventually I realised that the bridge was lots of metalwork flags. No Union Jack on my side of the road, and there were lots of cars parked the other side so I couldn’t see many of the flags there. I pootled back towards Charlottenburg and then, as I got reasonably near, I saw a sign to the Funkturm. Why not go and have a look at that too? It was, I believe, the home of MI6 during the cold war. On the other side of the road is one of the huge Messe buildings – there’s an electronic gadgets show on at the moment so I’m keeping my credit card safely away from that. More Funkturm – it’s not as pretty as the Fernsehturm at Alexanderplatz (which was East Berlin). Traffic was getting a bit heavier now as it was rush hour so I headed back, finding my entire route was on pretty decent roadside cycle paths. They often have their own bike traffic lights too. I stopped off to buy something for dinner tonight at Kaiser’s (a supermarket) and the lady on the cake counter persuaded me to buy a “Kalter Hund” (cold dog) which appeared to be some kind of loaf cake. It has to be kept refrigerated, she said, and it has chocolate and biscuits in. Sounded good, so I bought it – it should last me a few days. This is what it looked like in its packaging. And this is what it looks like about to be eaten by me. It’s layers of biscuit alternating with chocolate moussy stuff, with more chocolate on the top. It’s very rich and very crumbly. Oh, and it’s best not to eat it beside the computer as when I pushed a fork into it a whole chunk flew across my iPad keyboard. Fortunately it’s a silicone keyboard so I just brushed the chocolate off, but I’ll know for next time. It was very nice, anyway! This afternoon’s excursion was about 16 miles, again at a fairly slow average speed due to all the traffic lights, cycle lanes and cakes. This morning I decided to do something recommended to me on Facebook last night – to cycle round Tempelhof airport. I wasn’t actually aware this is something you could do, but it certainly sounded interesting. My father visited Tempelhof by light plane a couple of years ago and clearly found it fascinating. The planes are no more, but it looked as if they hadn’t yet built houses all over the site if Olaf thought I could cycle round it. 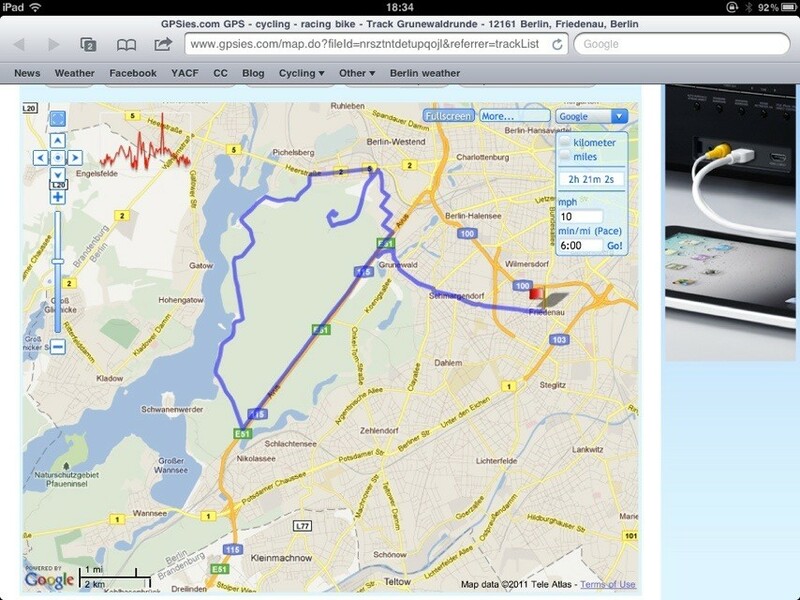 So I set off, having found Platz der Luftbrücke on my Garmin GPS and following its route there. It started well – down a short stretch of Straße des 17 Juni before veering off through the Tiergarten on a reasonable track. However, it soon involved a lot of faffy minor roads and I decided in future if I knew where I was going I’d take the main roads there, even if slightly further, as they probably have better cycle paths. I arrived at the front of Flughafen Tempelhof – it all looks a bit sad and forlorn now that it’s closed. The bit that you can cycle around is the area of the runways and taxiways which was a good kilometer away – the buildings around the front entrance are immense (I think the airport has the largest single building in Europe, or something) so I found myself cycling down Columbiastraße (I think that was its name) for a surprisingly long time before I found the entrance to the park. What they have done is made Tempelhof Airport an open space for people to use – cyclists, skaters, kite flyers, dog walkers. Cyclists and skaters are meant to keep to the tarmac (sensible), dogs are on a lead apart from in two fenced-off exercise areas where they can run around off-lead, there is an area for barbecues, there are a couple of bird reserves and there was also some kind of veg growing area. I made my way straight away to look at the back of the main buildings of the airport – a pilot’s eye view, I suppose. EDIT: Dad sent me this photo of when he was there – it looked much less dilapidated then. I then was rather startled to see what looked like a person hanging from a kite! When the kite landed it was clearly just a person-shaped cloth, but it did give me surprise! And then I found myself on the runway. So, of course, I had to try and whizz down there. There was no danger of me taking off, however, as I barely got the trike to 18mph. Clearly all that cake is slowing me down! I cycled all the way down one runway and then back up the other, pretending to myself briefly that I was on Top Gear (they’re always messing around on an airfield, although at slightly faster speeds). There were quite a few skaters, walkers and cyclists around but there was plenty of room for everyone! So then I found my way out of the park and headed back home, using the main road (Tempelhofer Ufer, I think it’s called) which unfortunately had a rather rutted cycle path. When I saw a sign directing me onto a different road which was going to Potsdamer Platz I thought I’d go that way, rather than all the way to Alexanderplatz, so found myself on a much better bit of road. Anyway, I arrived at Potsdamer Platz which is an interesting place on foot but less handy by bike. There were lots of tourists walking all over the cycle paths who didn’t react to bells or shouts and it was all a bit confused. I headed off along the main road (excellent quality cycle path) towards the Brandenburg Gate and Reichstag. I stopped to have another look at the Holocaust Memorial which I visited a few years ago. The trees that were planted in it have grown up rather well. And then I arrived at the Brandenburg Gate with a good view of the Reichstag. And this is the view down Straße des 17 Juni back towards my apartment – the Tiergarten with the Siegesäule in the middle. And here’s an attempt at a classy photo whilst I was cycling along at 11mph. In my mirror one sees the Brandenburger Tor and also someone on a Segway! The Russian memorial – this is flanked by two tanks (unfortunately out of shot – again I took this whilst cycling along). On the way back to my apartment I stopped off at a bakery to get my lunchtime treat – a nice doughnut! So another enjoyable trip, 15.5miles at an average of less than 9mph, but great fun! It was time to fold Alfie up as small as possible so that I could actually fit some luggage in the car as well. I removed the mirrors, bottle cage, slid the boom in as far as possible and twisted it on its side so that the chainrings were protected. You’d have to have strange legs to be able to pedal this beastie! I put him in the boot of the S-Max, ensuring there was plenty of padding cardboard and bubble wrap to prevent him getting damaged. And then Ken and Kenny, my co-drivers, arrived and put their very modest amount of luggage in the boot and on the floor of the back seats. We set off earlier than originally planned which meant we reached the Channel Tunnel 3 hours before our scheduled crossing. However, they let us straight on and we were in fact the first car onto the train, and there only seemed to be a couple of dozen on that train in total. Ken (the minister from my church, another big Berlin fan) had driven the section from Colchester to the tunnel. Kenny (Ken’s friend from Scotland, also a Berlin fan) then drove the next bit… to the first filling station to pump up one of the front tyres which looked rather low. It was down to 1.35 bar (should have been 2.4) so we’re glad we checked. Kenny carried on driving after that, and after a couple of hours I took over. We had driven through France, Belgium, Holland and had finally reached Germany. The SatNav warned us we had 400 miles to go on this road, which was a bit boring. I had had enough of driving by 12:30am German time and decided to hand back over to Ken. At this point I installed myself across the back seats with a blanket and a pillow to try to get some sleep. I did manage some sleep, off and on, as did Kenny in the front. The other two did all the rest of the driving, which got easier as the night wore on and the traffic thinned. At about 5am we stopped at a motorway service station for a cup of tea. There were a surprising number of people there but I wasn’t at my best being so tired so drank my tea and kept quiet. We carried on, having realised that we were way ahead of schedule (having left early) and that this meant that we would probably arrive at our respective accommodations rather early. This was indeed the case. Although the last hour into Berlin in their rush-hour was a bit more stop-start, our whole journey of 690 miles was pretty easy and we were parked outside Ken & Kenny’s apartment (they have stayed there several times before) at 7:30am. We texted our respective landlords/landladies. Mine said I could go to my apartment to collect the key at 10:30am, Ken couldn’t get hold of his. I decided to walk over to my apartment (a mile away) and get the lie of the land. It turned out to be a very nice looking apartment block next to an Aldi and a REWE (two supermarkets). Eventually 10:30 came round and I met a very nice chap who showed me round, including the impressive bicycle garage, told me where we could put the car to unload, and relieved me of the balance of the payment for this flat. It was excellent value. Once Alfie was unloaded and my things carried up to my room, Ken and Kenny went off to their flat, having finally made contact with their landlord. After a cup of tea (I had to go and buy a decent mug, and some milk of course) I finished off rebuilding Alfie and decided to go over to visit Ken and Kenny as I’d left some paperwork, including my passport, in the car (which was being parked at their flat as the parking there is free). I rescued Alfie from the Fahrradgarage which is very spacious but rather choc-a-bloc with bikes. I headed off to Ken & Kenny’s apartment which was on the 13th floor of a high-rise on the edge of the Tiergarten. What an amazing view of the Siegesäule, Potsdamer Platz, the Fernsehturm and more, although I discovered a hitherto-previously-unknown dislike of standing on their balcony which I felt was a bit spindly. After collecting my missing paperwork, and after straightening up Alfie’s boom which had definitely been listing to starboard on my mile’s ride, I headed off. Having looked down at the Tiergarten from the lofty heights I decided to cycle through it to the Brandenburg Gate, somewhere I like to visit. The main road (Straße der 17 Juni) is wonderfully wide and has an excellent cycle path along both sides. You can see the Brandenburger Tor and the Fernsehturm (TV tower) in this pic. After cycling around the pedestrian area at Alexanderplatz (and chatting to various Germans who asked me about the trike) I headed off to Friedrichstraße, another well-known German road. It has a very good book shop, Hügendübel, from which I bought a book about cycling from Berlin to Britain (my plan for next April/May). I cycled back past the Hauptbahnhof, a very impressive, relatively new, station. Fairly near to my apartment I crossed over the Spree river looking rather peaceful. I was back home after doing about 12 miles. It was fantastic to visit so many familiar places but from a new perspective – lounging on a deckchair in the road.